This time I am reviewing the Matsya Purana. This is the fifth Purana that I am reviewing, that has been written by Bibek Debroy. The Matsya Purana comes sixteenth in the list of Mahapuranas. The Matsya Purana has fifteen thousand couplets. It is a medium sized Purana. There are fourteen thousand shlokas which are divided into two hundred and ninety-one chapters. You might get a bit confused at this point because I earlier mentioned fifteen thousand shlokas but in the fifth line I mentioned the division of only fourteen thousand shlokas. The book doesn’t mention the division of the last thousand shlokas. Well, that must means that the last thousand shlokas have not been divided into chapters at all. The Matsya Purana is a tamsik Purana, a Purana that glorifies Shiva. Lomaharshana is the narrator of the Puranas to some sages in the namisharanya forest. This Purana was originally recited to Manu by Lord Vishnu in his Matsya avatar. It is also considered as the most holy of Puranas because it was recited by Vishnu himself. Well, the question now is how and when did Manu hear the Matsya Purana? It so happened that Manu was meditating at the foothills of Mount Malaya. A pleased Brahma appeared and asked Manu what he wanted. Manu replied that he wanted to be the one to save the world from destruction in the current era. Brahma granted the boon and disappeared. Soon, the time of destruction dawned. As promised, Manu got a boat and collected all the great rishis and animals in the boat. However, before all this had happened, Manu had found a fish that had kept growing size. It became so large that it was too big for the whole ocean. Well that same fish came back and helped Manu steer the boat in the tossing and turning waves that were engulfing the entire Universe. The fish was none other than Vishnu in his Matsya avatar. Manu asked many questions, and the answers of the fish were written down in the Matsya Purana. So far this was the review of the book. Now I am going to give my views on the book. This Purana was quite interesting to read because it had quite a few stories and facts that were unknown to me. For example, the types of daan and the 106 places to pray to Sati, etc. Like most Puranas this was nice to read. In the process of reading five Puranas, I have realized that the books follow a kind of pattern. First, there always comes some introduction about the Puranas in general. Next, comes the introduction of which Purana is the book about. Thirdly, comes the length, size and number of the Purana. Fourthly, several stories follow along with the creation and destruction of the Universe. Fifth comes a few other facts that are not mentioned in the other Puranas. Lastly, the holiness of the Purana. The Matsya Purana follows all of this. Now, as you can see all that is left is to describe the holiness of the Purana. Let me do just that. If you read just one chapter of this Purana all your sins are forgiven and you go straight to heaven. 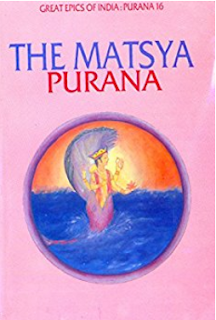 Read “The Matsya Purana” By Bibek Debroy to find out more about this Purana.